I have to start this post out by saying that I could not have chosen a better place to study abroad than South Africa. There is a tremendous amount of culture and diversity, and the people are interesting and hospitable. The history of South Africa is shown and told proudly everywhere you go. When I first decided to go, I had no idea what to expect or what I was going to see. Everyday I learn something new and exciting, and I have a feeling the next five months are going to be the best of my life. 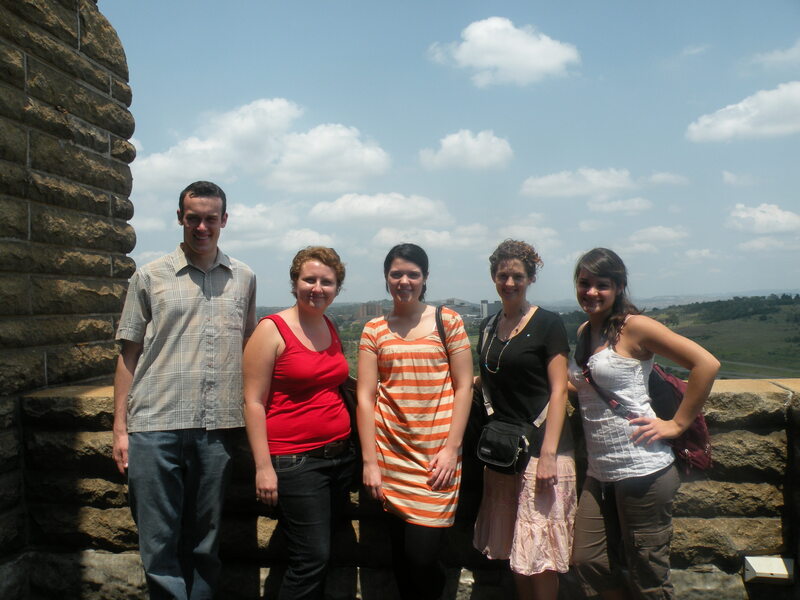 I arrived in Johannesburg, or Jo’burg, two weeks ago and traveled 45 minutes in a taxi to my new home in Pretoria. 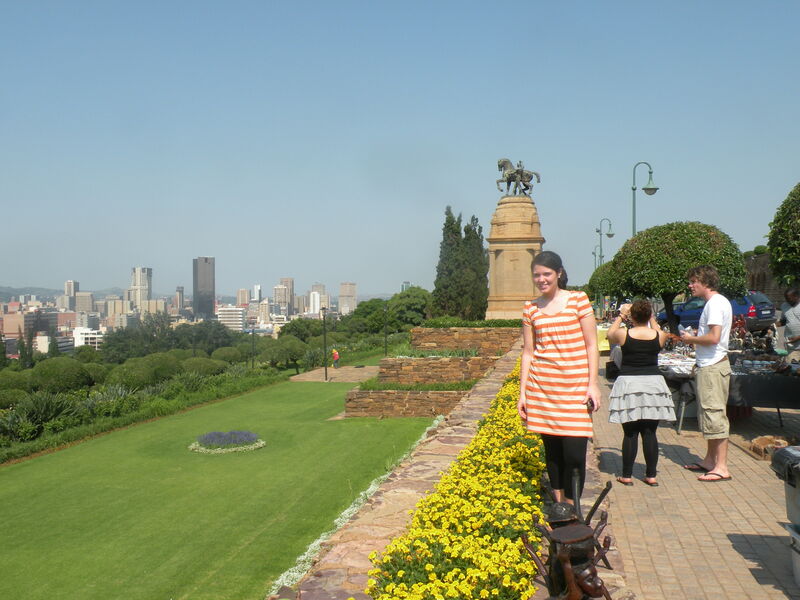 Pretoria is the capitol of South Africa and is where the University of Pretoria is located. UP is the largest residential University in South Africa, and is about 3 times as large as OU. I live in a housing area called Tuksdorp where international and masters students stay. Both Tuksdorp and the University are gated in and you have to have a card or student ID to enter. There are also security guards at all the entrances 24 hours a day. You have a definite sense of security while at the same time knowing that it is a dangerous place. There are two official languages of the University and 11 official languages of the country. The most used languages are English and Afrikaans. In my house, there are seven girls including myself. two are from the Netherlands, one from Germany, one from Austria, one from Turkey, and two of us are from the US. It is a very interesting mixture of people and culture and we are constantly learning something new about where each of us are from. My favorite part is being one of the only two that are native English speakers. Sometimes I feel like I’m being used as a dictionary. Sila, the girl from Turkey will describe something and then snap her fingers while saying, “Haley! Vocabulary, vocabulary!” Then I have to tell her what the thing is that she’s describing. One morning it was, “what are those sticks with cotton on them that you clean your ears with?” Another time I was asked what the word is for babies getting milk from their mothers. Everyday is something new. And food is a whole other story! We have already decided to specify certain nights when we each make dinner from our countries for everyone in the house. We found corn dogs at a market last weekend and everyone was saying, “Oh that is so American, right?” I made everyone try it and now they love them. Out of the 30 or so exchange students here this semester, only five of us are American. The internet is a very difficult thing to get in South Africa. Right now, I’m sitting at an internet cafe three blocks from my house paying 12 rands an hour (about two dollars… it really adds up though) to use their computers. This is my only source of internet here. Also down the street we have a shopping center with everything that we could need… a pharmacy, grocery store, book store, clothing, photo center, and much more. There’s also a McDonalds that seems to always be quite busy. The only similar restaraunts are KFC and McDonalds. Other than that there are cafes and restaurants that serve mostly local dishes. I’ve already sworn off eating any more chicken in a restaurant here because it always seems to include the backbones, other bones, and skin. It is quite difficult getting to the actual meat. Another interesting thing is that at the grocery store and other stores, they charge for plastic bags. They also don’t stand at the register, they sit. The last two weeks have been mostly traveling and getting used to my new environment. I registered for my courses last week and school doesn’t start until January 28th. I am taking international trade, South African politics, Afrikaans, and two other political science classes. For each class there is only one section with many many people. The times and buildings also vary from day to day. You might have a class that is Tuesday from 9:30-10:20 in the Economics building, Wednesday from 7:30-8:20 in the Economics building, and Friday from 14:00- 15:20 in the Theology building. It’s pretty confusing and I’m sure will take me several weeks to not have to look at my schedule each day before classes. Well that’s all for today. Look forward to my next blog about my travels so far! I am so excited and proud of you!! Thanks for sharing your great experience. Great to learn what you are doing! You are a very good writer…interesting info. I know that you are going to love this experience so much. I spent the summer in France going to school and it was something that I will never forget. It is so good for you to experience other cultures. It sounds like you are going to get the most out of this wonderful opportunity. Embrace it! Hi Hayley, (I work with Brent) Glad to hear you finally arrived in sunny SA, Your descriptions of your new home is wonderful. I left S A 8 years ago and have been back twice once to visit and once to pack up. Have you tried a Wimpy breakfast yet? My American husband, loved going to Wimpy anytime, only thing he never got used to was no refills of anything!!!!! I will be keeping up with you and your local experiences. Have a wonderful time in my birth and home country. It really is an exceptional place and has some of the most beautiful places ever seen, comparable to anywhere in the world. You are a very good writer!!! i so enjoyed the first of and look forward to many more of your posts! i also want you to know i just now replaced that wonderful fist bump of Michol and President Obama with Emily’s thumb photo from Lori with that lovely picture of you in Pretoria as my background on my computer here at work. better place cause of you. keep up the good work. Howdy from Okie land from your cowgirl Auntie Kim and Uncle Kyle!!! Cool site. We are so proud to know such a world traveler. Looks like all your momma’s extra shifts have paid off. You are a very graceful and accomplished woman. HALEY!im so glad you’re having an amazing time. i just knew you would. when everyone was crying at the airport i wanted to scream this is a good day and this lucky girl is about to have a life changing adventure so tears aren’t allowed! i didn’t that would go over very well so i kept my mouth shut.i hope you stay happy and safe. and im sure you’re worried sick but don’t be.. jack is just as spoiled as ever and everytime i see him i say your name 500 times so there is no way he will forget about his mommy. i love you very much and we are all so happy for you! just stay true to yourself and have best time you possibly can it will be over before you know it. Hello from Albert and the kitchen staff at McGill’s! Glad you’re enjoying yourself.